After spending a few days with the testing of the driver and assembling the new coil,today I finally hooked it up to rectified mains.The results are amazing!I had no time to make a proper video,but here is a shot from a pretty breakout at a LOW on time. The first question is how to calculate the maximum primary current?My IGBTs are rated for 300A peak and I want to keep the current under 200A for safety. That's an awesome result! 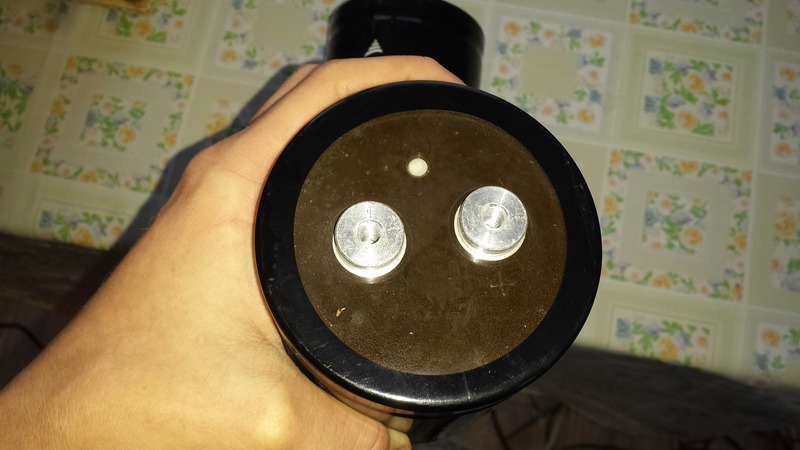 The coil and the enclosure look sweet man. 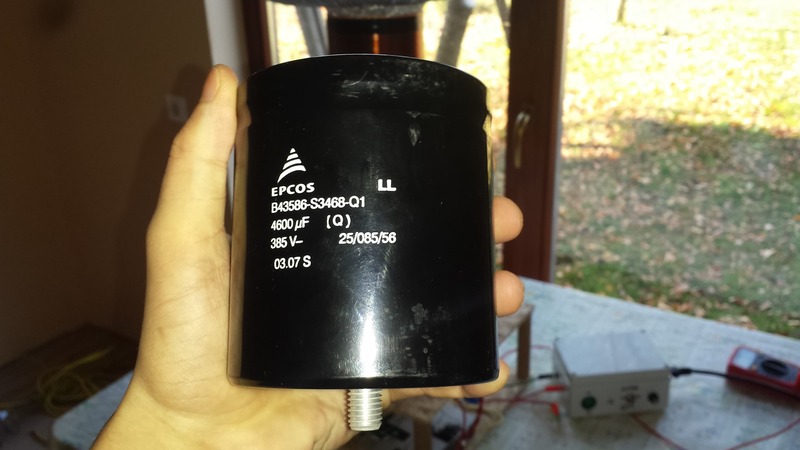 As for the primary current, if you have an oscilloscope you could just make a 1:1000 ct and measure it that way. But one question I have. Is this running as a sstc or a drsstc? To do an easy primary current calculation you could simplify it as follows: Primary reactance: XL = 2pi * f * L = ? Ohm, use Ohms law to calculate the current by using your peak-to-peak square wave voltage, if you are using 230VAC rectified that is ~320VDC. So Primary current = 320 / XL. This calculation ignores primary resistance and dc blocking capacitors reactance as they are small factors. I'd second the recommendation for a CT measurement of primary current. Easiest is to wind two CTs of approx 32 turns each, using the output of the first as the single input turn of the second, giving ~1000:1 total ratio and good high frequency response. A 10R burden resistor then gives a handy 0.01V/A reading. I wanted to calculate the maximum primary current before running it at full power,so I can be sure that it will not blow.I have two sets of ~1000 current transformers,which I used before as OCD.Not sure if they lowers the performance or not as SSTC operation. The main reason for using the upper topload was to lower the resonant frequency to make switching easier.By the way it improved the performance and increased the input current significantly and it might cause primary flashovers just like your SSTC.A capacitor between the negative of the bridge and ground would be a good idea I think. I calculated the primary inductance using JavaTC.It is around 8uH.At 170kHz this means about 8.5 ohm inductive reactance,which should limit the current under 38A.Now the real problems begin.What else can cause silicone breakdown? 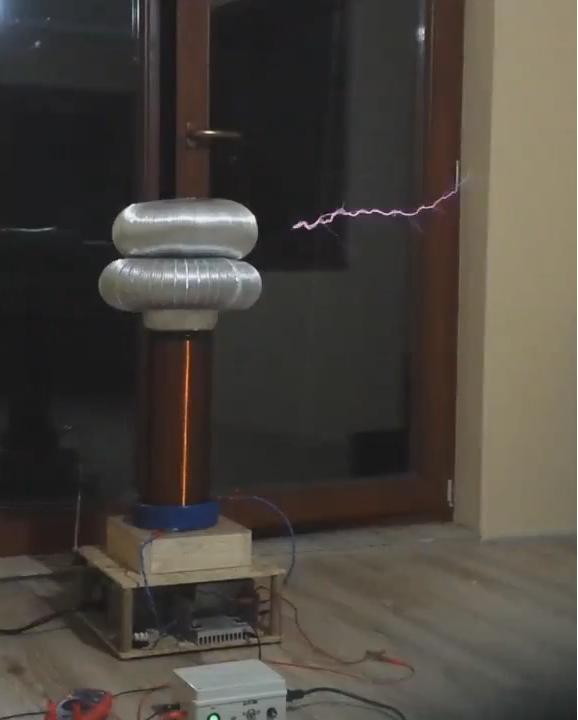 In this week I had two presentations with this coil on my school's physics show.It was working on the first day,but on the second day after I cranked up the on-time over half on the oneTesla interrupter(lookup table scale 10)it stopped working and the fuse blown silently.It's not a big shame,since it was working for about 15 minutes before it died.After taking the bridge apart a low side transistor and it's high side pair's diode was dead(don't know yet if the 440V TVS or the MUR1560).I think a spike killed the diode and then the transistor was short circuited.If the 440 TVS failed is it recommended to omit them or switch to a higher voltage TVS?Also the previous time the bridge blown by almost the same reason,running it at highish on-time for a few seconds. I'm planning to make a better full bridge layout.I want to still use TO-247 transistors as they are cheap.Is there any way to make a low inductance single side(maybe etched)board? 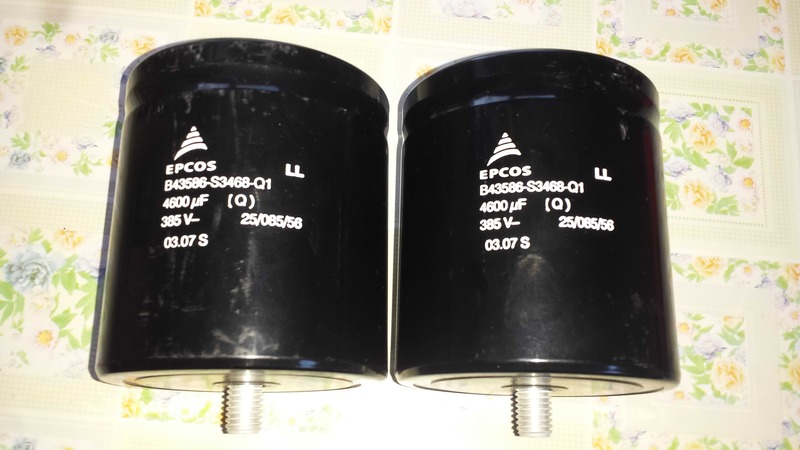 Today I received a package containing two LARGE EPCOS B43586-S3468-Q1 4600uF 385V capacitors.They are really overkill for this medium sized coil with a HGTG30N60A4D fullbridge even though more is better than less I am thinking about selling them,maybe create a post on the marketplace.They were used,but their capacity is right accordingly to my multimeter. I started again the assembly of the coil today and figured out that I used bidirectional TVS diodes instead of unidirectional ones(1.5KE440A instead of 1.5KE440CA).Pretty stupid mistake! One problem I already have is the charging of the DC bus capacitor.In the past I used a resistor to charge it and a switch to bypass the resistor,but with this setup the switch can be a problem with one of these large capacitors at huge currents,because the high current flows through the switch.The other possible solution is leaving the capacitors connected to the bridge and put a resistor with bypass switch in series with rectified mains.This way I will be able to use half or full wave rectified mains for sword-like sparks only if I unscrew the capacitor. 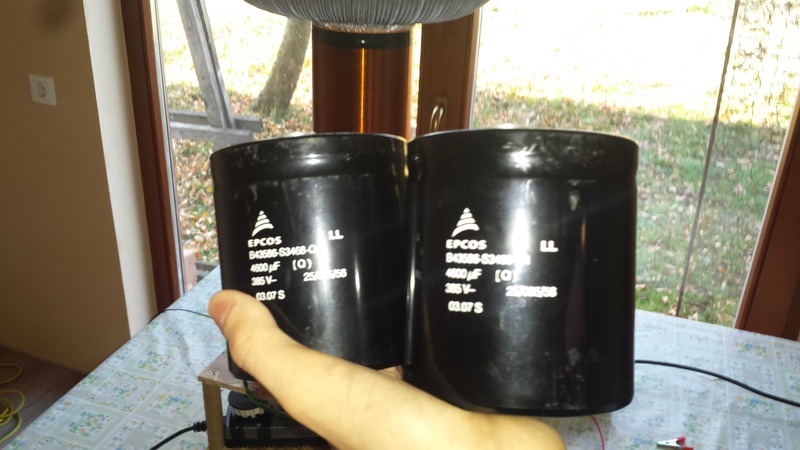 Those are some serious overkill capacitors!